Cotton Polo Pull-over shirt for casual wear. This 100% Canton COTTON is a polo shirt you can wear everywhere. The Weekender Polo shirt has a 2-button polo neck. The relaxed ribbing around the waist hem is nice because you will not have to tuck it in for a neat look. Sizing comes in S, M, L, XL, & 1X. See below for Chest measurements in Size Selections. Wear this Weekend Polo year round for any chilly weather. 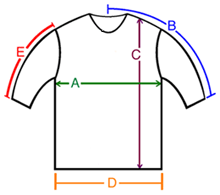 A: Chest / Bust circumference 43-44" 44-45" 45-46" 48-49" 49-50" 50-51"
B: Sleeve length from center of neck to end of sleeve 32" 33" 35" 35" 36" 37"
C: Body length from shoulder to bottom of hem 26" 26.5" 28" 28.5" 28.5" 29"
D: Hem circumference 37" 37" 38" 40" 44" 45"
E: Sleeve length from shoulder to end of sleeve 21" 21.5" 22.5" 22.5" 23" 23.5"
THE MOST COMFORTABLE POLO EVER. HAVE HAD SO MANY COMPLIMENTS ON THE COLOR (CRANBERRY) AND THE STYLE. I AM ORDERING ANOTHER IN A DIFFERENT COLOR.